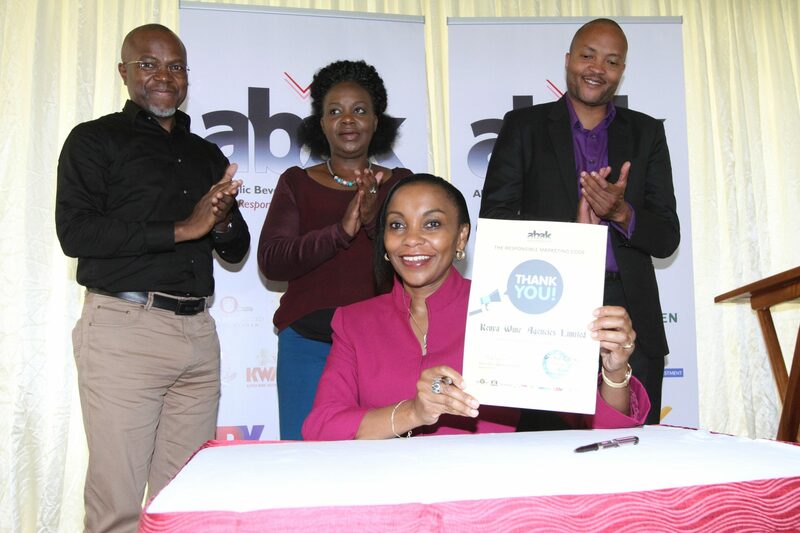 Kenya’s leading manufacturers and distributors of alcoholic beverages under the aegis of the Alcohol Beverages Association of Kenya (ABAK), have signed a self-regulatory Code of Conduct that will guide how they sell and market their products to consumers. The Code developed by ABAK, is the first such attempt by a category manufacturer at self-regulation in the country and will help guide the sale and distribution of alcoholic beverages in an industry that contributes in excess of Sh100 billion annually to the exchequer in taxes. It will also set a unique standard for promotion of responsible drinking, sale and distribution of alcoholic products as it demands the highest degree of responsibility and ethics from both retailers and suppliers operating in this channel. Its adoption follows a unanimous decision by members of ABAK to initiate a self-regulatory code to guide amongst others, communications produced directly by or on behalf of marketers, intended primarily to promote alcoholic products. These include brand advertising, consumer communications, promotional events, packaging, labels, sponsorship, “advertorials”, and point of sale materials. “The code goes to the heart of our commitment to self-regulation. It is about being legal, decent, honest and truthful in the way we market our brands so that, as an industry, we can help address social issues such as drinking and driving, underage drinking and heavy episodic drinking. The Code doesn’t serve to summarize or substitute national laws, policies or codes, which must always be upheld. It explains ABAK’s approach to self-regulation,” said the association’s Chairman Gordon Mutugi. The code’s purpose, he added, is not to curb marketing freedom and creativity, but protect everyone involved in the value chain, including advertising estimated to be consuming in excess of Sh10 billion in advert spend from the industry annually. The association said it would be engaging all stakeholders in the industry, including those with oversight roles to ‘spread the spirit and values’ of the “ABAK Code of Conduct” across the country and actively promote its adoption. “ABAK is confident its members will take a proactive and responsible approach in their endeavors to comply with the provisions of the Code,” says Mutugi. The alcohol industry has been under increasing scrutiny by regulators in Kenya and across the globe, with calls for textual and pictorial health warnings, structural separation in shops and restrictions on sales. ABAK says that the new code of conduct has been designed to respond to those challenges and to complement any existing laws and guidelines enshrined in the Constitution being followed by individual alcohol manufacturing companies and other bodies. “We strongly believe that the adoption of pro-active self-regulatory measures such as this will be a valuable tool when defending any future challenges to the industry both locally and globally and will help demonstrate our commitment to ethics and fairness across the value chain,” said Mutugi. “It will also show that efficient self-regulatory rules are already in place in the industry, hence the importance of strict compliance by the industry. Alcohol sponsorship of sports, music and cultural events in the country makes a significant contribution to the country’s vibrant and diverse economy and has had an important social impact. Funding also delivers essential support allowing investment in grassroots programmes nationwide. The Code has now formalised much of the activity, which was already central to the alcohol industries’ sponsorship agreements and will help establish a new ‘positive commitment’ for alcohol producers to promote responsible drinking as a part of the deal they signed today. together Kenya’s leading manufacturers and distributors of alcoholic beverages. ABAK exists to support the alcohol industry by providing training, information and technical expertise to government agencies, consumers, value chain players and the society at large. As leading alcoholic beverage producers and distributors in Kenya, we communicate to a number of consumers, colleagues, customers, clients and suppliers every day. As such, it is imperative that our communications not only reflect the passion and respect we bring to our work, but also the fact that we take our responsibilities seriously. Members include Africa Spirits, FRM Packers Ltd, Heineken, Kenya Breweries Ltd, Kenya Wine Agencies, London Distillers, Monwalk Investment, UDV, Vine Pack Limited, WOW Beverages and Zen Hong Limited.